Mobile gaming is exploding in popularity, faster than any other learning technology. In this session, we will explore various mobile learning games and discuss the decisions that influenced their game design, learning design, user interface design, and user experience design. We’ll also share a case study of how a mobile learning game was used as part of a larger curriculum to drive business results. Knowledge of the four design quadrants that are part of mobile learning game design: user experience (UX), user interface design (UI), instructional design (ID), and game design. Sharon Boller is President and CEO of Bottom-Line Performance (BLP), a learning solutions firm she founded in 1995. Sharon has grown BLP from a single-woman sole proprietorship to a $4 million company with 33 team members. Under her direction, BLP created the Knowledge Guru learning game platform, which has received numerous industry awards, including a Brandon Hall ‘Gold’ Award for best innovation in gaming and technology. Sharon is a frequent speaker at industry conferences and co-teaches learning game design workshops with Karl Kapp for ATD and eLearning Guild events. 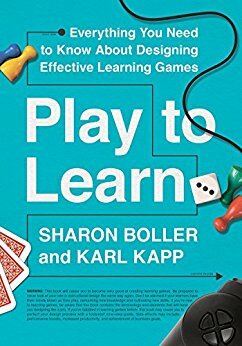 Sharon and Karl’s new book, “Play to Learn: Everything You Need to Know About Designing Effective Learning Games,” was published in Spring 2017 by ATD Press. Sharon earned an MS in Instructional Systems Technology from Indiana University.